Buying your first acoustic guitar is a tricky business. On one hand you want a guitar that won’t cost you too much in case the whole playing guitar thing is just a phase, but on the other hand you want a guitar that sounds good enough to actually get you excited about learning the instrument. And when it comes to most acoustic guitar starter packs, they tend to fall tragically short in terms of combining affordability and sound quality. Fender’s FA-100 acoustic pack, however, might actually be one of the very few exceptions. Fender has been in the business of making amazing sounding guitars since the 1930s so you know that any product that has the Fender name on it carries some weight. And at a little over a hundred dollars, the FA100 acoustic pack is a good bet as any for a beginner guitar. 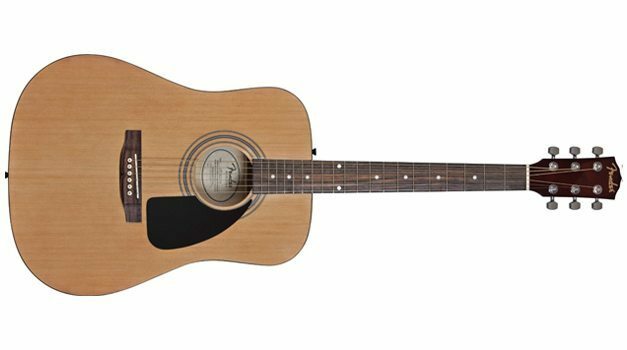 The Fender FA-100 is a no-nonsense dreadnought with laminate spruce top and basswood back and sides. The guitar also features a rosewood fretboard and Fender’s signature headstock shape. The tuners are chrome and the guitar comes with a standard gloss finish. All in all it’s no masterpiece, but it’s not too shabby either. As far as the guitar’s setup goes, the action, while not excellent, is low enough to play comfortably. And in a way, starting off with a guitar with a higher action is a good way of developing finger strength before moving onto a higher quality instrument. If you pick up this guitar expecting an incredible sound, you are sure to be disappointed. Guitar makers like Fender are able to offer their entry level models like the FA-100 for such low prices because they use cheaper laminate woods on the bodies, as opposed to solid wood which can be extremely expensive. And although this results in a comparatively inferior tone, the FA-100 still delivers a respectable full-bodied sound which gets the job done for any beginner guitarist. And with age and a set of high quality guitar strings, the instrument can actually sound quite nice. As an entry level model, it’s hard to expect extremely high build standards. And although the FA-100 isn’t shabby by any means, it doesn’t suffer bumps and scratches as well as a solid body guitar with a higher grade finish would. A great guitar starter pack always includes the basic add-ons that a beginner guitarist might not think of at first, but will start needing a few weeks into learning the guitar. And the FA-100 doesn’t disappoint in this regard. The pack comes complete with a padded gig bag, strap, electric tuner and a collection of picks and strings. All in all, the FA-100 starter pack is an excellent option for anyone looking to dip their toes (or fingers) in the world of guitar playing without having to invest a significant amount of money in an instrument.